that I’ve ever allowed myself to suffer. Then when it came to the winner, Robin Stjernberg, I can’t think of a worse candidate since The Ark, and never could I believe that Sweden would send such a lame candidate to the Eurovision finals. It just re-emphasises the appalling year overall. Already noted were the lack of any big names. Was there some sort of agreement not to run to ensure Sweden doesn’t win two years in succession? Even then, among these lower profile names, you expect at least one decent song. The lack of good songs could be just a quirk of the year. You can’t expect the same standard year in year out, and there was almost impossible anything could match Euphoria. It would have been a astronomically wild that the planets could align in the universe so well for two straight years. As for the winning song, that’s a different story. The results show Yohio rated second last in the jury voting, effectively crucifying their chance after winning the televote just ahead of Robin. Sweden used an international jury this year, rather than an all Swedish jury or a 90% Swedish jury of recent years. Almost certainly that will change. Swedish people, whether televote or jury, should decide for Sweden. No doubt that the international jury was the idea of that twit, MF organiser and constant meddler for the sake of meddling, Christer Bjorkman, probably trying to make an international “feel good” gesture as some sort of global socialism. Next thing Bjorkman won’t want any countries at all in ESC, just random Europeans. While he might cite good ratings, that’s primarily because Sweden are ESC hosts so there’s a greater interest in their candidate. Presuming a Swedish jury would be closer in mind with Swedish public (as historically they are), Yohio would at least have provided some energy for Sweden at their own contest. Instead, it’s this tepid gibberish by someone that probably couldn’t make the top 50 of Greenland Idol and could only advance through “The Voice” if they had deaf auditions. Sweden lost the plot. It’s time to return to Swedish values, Swedish mentality and a format that will produce more consistently songs more symbolic of Sweden. International viewers do have an expectation about Sweden’s entry and quite simply they are not matching. That’s more for wrong songs emerging from MF, rather than song availability itself. That trend started since the format was dragged out to 6 weeks about 10 years ago. That sees fans attach themselves to the artist, or “the story” of the artist, rather than the most fitting song. While reverting to one night might too drastic, four weeks might be the best compromise. Three semi finals of 12 songs with the top 4 to the final, then another 3 as second chance via a jury wildcard or midweek review-type show with televote (no live performances). Total songs drop from 40 to 36, and the final is 15, not 10. Please Sweden. After a year that Euphoria saved Europe from those stupid Russian grannies winning, let’s not descend into the cesspool of mediocrity with songs like Robin Stjernberg, The Ark, Charlotte Pirelli and Anna Bergendahl, not when alternatives go begging like Yohio, Sanna Nielsen’s Vågar du, vågar jag” or “Empty Room”, and Timoteij’s “Kom”. Easily the worst MF ever and shaping up to be the worst ESC ever. 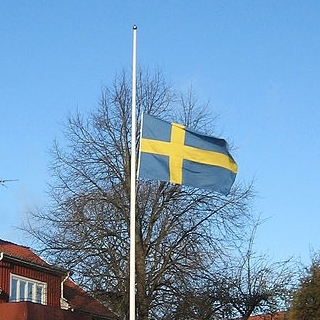 Sweden’s flag should be at half-mast today until ESC is finished.